Prepare this dish by first preheating your oven to 400 degrees. Place the raw fish in the center of a large piece of aluminum foil. Fold the edges of the foil up to avoid leaking. Brush the lemon juice over the fish and then sprinkle with spices. Fold the sides of the foil even more to make a packet that is sealed on all sides. Place in oven on a cookie sheet (just in case your packet leaks), Cook for 10 to 15 mins, until fish flakes. 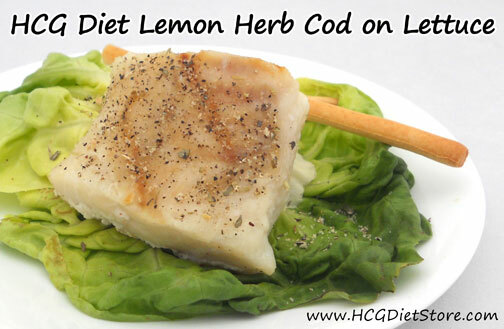 Serve your fish over lettuce and with more lemon juice squeezed on top. Serve with 1 Grissini Breadstick for some 'crunch'. This recipe is allowed on the VLCD phase of the diet (also known as Phase 2 or the 500 calorie phase). This recipe equals 1 serving of vegetables, 1 serving of meat, 1 serving of ‘carbs’ and part of your daily allowed juice squeezed from a lemon.